These are extensively used in heavy industrial and commercial applications such as Factories, Warehouses, Workshops, Loading Docks, Carpark entries etc. Heavy duty curtain construction consisting of individual, roll formed, interlocking slats. Individual slats can be replaced should damage occur, thus reducing repair costs. Nylon end clips are used to stop lateral movement of the curtain and to provide smooth operation. Custom built to suit individual large doorway openings. Chain operated or motorised as required for specific purposes intended. Wicket gates and escape doors can be incorporated (restricted). The curtain will be manufactured from roll formed, galvanised steel, having a thickness of .6mm, .8mm or 1.0mm (as specified). Each alternative slat will be fitted with a specially moulded nylon end clip to prevent lateral movement. 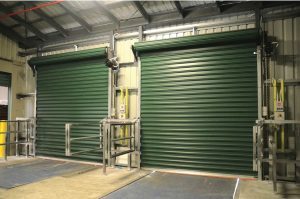 Shutters will be supplied with roller drum, brackets, guide channels and all necessary components and installed to manufacturers recommended specifications. The Door curtain will be constructed using 1 00mm profile, galvanised, roll formed, interlocking steel slats in thickness of .6mm, .8mm or 1.0mm as specified. Use:-Medium size openings in commercial applications and very large openings in industrial applications. Size: Up to 7000mm high by 9000mm wide. Thickness: 6mm, .8mm and 1.0mm. Fully perforated curtains up to 7000 wide. Partially- perforated curtains up to 9000 wide. Any special applications to manufacturer's recommendations. Up to 6100 the bottom rail will be manufactured from specially extruded, heavy duty aluminium interlocking (to slats) angle section. Over 6100 the bottom rail will be steel box section. 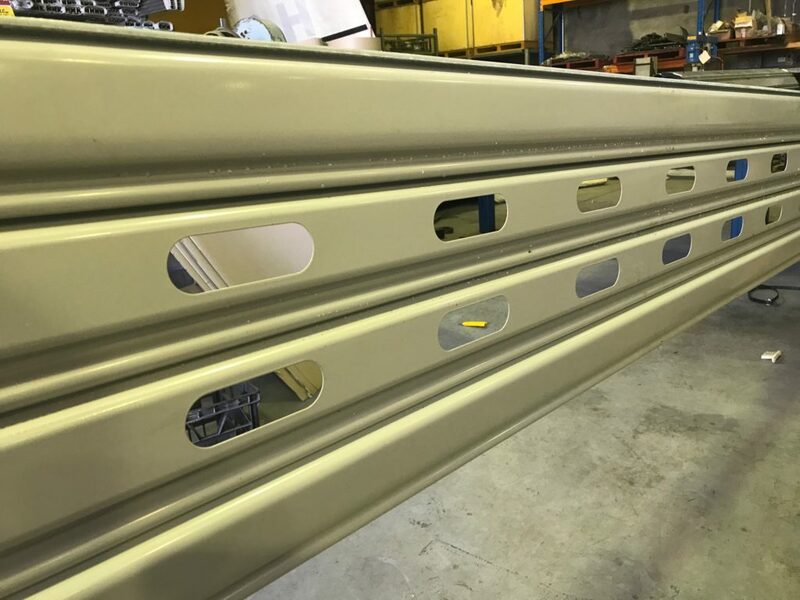 Guide channels will be manufactured from rolled formed, galvanised steel channel section, formed to suit curtain depth and working clearance. The. 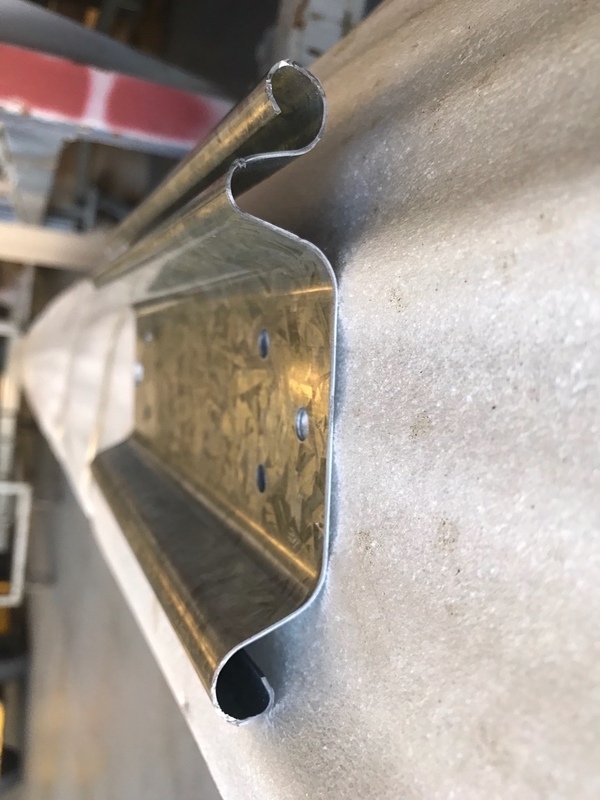 guide channels will be securely fixed to walls at intervals not greater than 750mm by masonry anchors and/or by welding to steelwork constructions. Centre mullions can be provided for multiple installations where specified and are normally of a sliding type. The roller drum will consist of a seamless, cylindrical tube encasing helical torsion springs matched to suit door size and weight and manufactured from a super grade wire revolving around a steel axle. The roller drum will be designed to give minimum deflection over the door span. The roller shutter drum wall support brackets will be manufactured from mild-steel plate, having a minimum thickness of 6mm and a maximum of 10mm thick and/or welded to suit door size and weight. Operation is by hand, chain or electrically motorised, according to size and preference or as selected. Wind-locks will be fitted where specified or required. Wicket gates 1200mm high by 600mm wide or escape doors 2040mm high by 920mm wide may be incorporated into doors over 2700min high and not exposed to high wind-loads. Ventilation can be provided when specified. The shutter chain and guides are supplied with a galvanised finish. All other components are given a printer coat of zinc rich Grey printer. Door Curtain slats are fitted with nylon end clips to stop lateral movement of the Curtain and ensure smooth operation. Wind-lock clips will be fabricated from mild steel, formed to suit specially designed guide channels and riveted to every 2nd or 4th slat as required and/or selected. Motorisation will be by means of an electric motor with one only three phase, geared 0.38 kw, 0.75 kw or 1.12 kw motor with self-contained floor and head limit switches, emergency hand chain drive in case of interrupted or failure of power supply. A reversing contactor up-down-stop push button station and thermal overload is supplied. Note: All electrical wires and wiring and setting of limit switches by others (qualified electrician) is not included. Gearing will be fitted to one end of the roller shutter and matched to suit door size and weight. Gearing is to provide ease of operation and basically manufactured from Grey cast iron spur gears or mild steel machine steel gears as required (for large door applications).